Tuesday 17 March from 2pm GMT, 9am (EST), 6pm (PT). Belgian Time 3 pm or 15.00 hours!!! 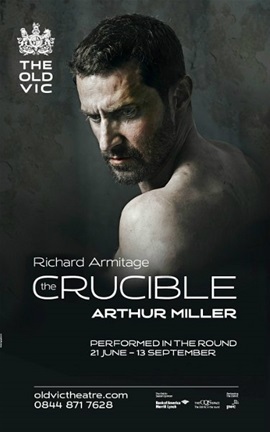 On July 2, I 'll be watching this play in The Old Vic, London. Needless to say I'm thrilled! I'll try to voice my sentiments on this page. I'm avidly reading all there is about The Crucible's premiere on Saturday last. I think I'm in for a veritable treat. Apart from the thrilling experience of finally seeing my favourite actor on stage, there's also the simple fact that I've never been in a London theatre before. I watched many plays, of course, but in Belgium, and they were in Dutch. Seems that this will also be a test as to how good my understanding of the English language is! Only one week left. Next Wednesday, we'll be on the train to London. It feels a bit unreal, at the moment. I don't seem to grasp yet how it will be. Fantasizing is so much fun. For those interested, here's information about the play. 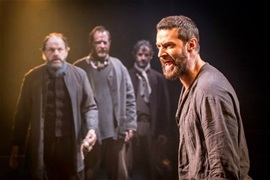 A new interview on Richard Armitage's performance as John Proctor in The Crucible has appeared in TheTelegraph. I found it refreshingly revealing on some sides of my favourite actor. I think I'm becoming quite the advocate! Currently reading the play's text. It's surprisingly easy to read! Miller wrote this in a seventeenth century language, with short sentences and clear wording. I find it very refreshing and very appliable to contemporary situations all over the world. The full text is available as a Penguin Classic book at Amazon for approximately 8 euros. Although my days are as usual bursting with activity, my thoughts keep wandering to London and The Old Vic. They are performing in The Round, a setting where the audience sits surrounding the stage from all sides. The stage is therefor resembling a crucible, which is of course appropriate for this particular play. So we will be able to view the action from all sides, getting to see the actors in all their splendor. The comments all speak of a magnificent performance by all involved. Stunning, talented, all-absorbing. And these are only a few of them. Oh, my! More and more comments, links and pictures keep coming up. How can one, at my advanced age, be so thrilled about seeing a play? I am thrilled, anticipating, excited, curious, like a child on Christmas Eve. Articles from the various critics are coming in fast , now. All succeed in wetting my appetite even further. And if there's a railway strike like there was yesterday, I might not get there at all. Heaven forbid! 6.30 am - We're leaving for the Eurostar to London. OMG, this is really happening! 8.30 am - Waiting to board the train. It's busy! I'll look out for Crucible billboards in the tube. Arthur Miller’s masterpiece about the fear of the unknown, and what it can do to a small, close-knit community lasts three and a half hours, yet never does it bore or lose intensity. Quite the contrary, I was swept into the intrigue, the action and the characters from the very first second. The actors, all and every single one of them, are excellent. Yaël Farber’s direction is superb and gives a refreshingly new view, with vicious violence overwhelming Salem’s community. Against that fearsome backdrop, we are witness to the battered, but still heartbreakingly touching romance in the Proctors’ marriage. The action is enhanced by the exquisite lighting (Tim Lutkin), the enthralling background music (Richard Hammarton), and by the sparse, dusty stage design (Soutra Gilmour). Due to the very original stage set-up of the Round, with the audience surrounding the players, we get a sense of participating in the action. A special boon to this is that the actors have to move and turn around frequently, to give every spectator a chance to watch their facial expressions. A very important detail, of course. Faces are what creates a bond between us, spectators, and the players. Now, Richard Armitage … ah, how to find the right words to express what I felt when I saw him on stage? When I saw him display that incredible talent of his in portraying the proud, honest farmer, John Proctor. It was a repetition of what he did as John Thornton; unraveling an image of a strong man, peeling of layers, until only the core remains. Thornton starts as a strong mill owner without pity for his workers and ends as a kind, compassionate master, and a passionate lover. In The Crucible, we see him do that all over again. At the beginning, Proctor shows himself a strong, hardworking family man with a deep interest in the community, and an aversion of hypocrisy. Gradually, the uneducated villagers’ fear , the subtle, cruel manipulation of Proctor’s former lover, Abigail (Samantha Colley), and the community leaders’ weakness chip away all layers of humanity in Proctor. What remains is a broken man, who is conscious of his adultery, and what it brought on his wife and family. The scenes between Proctor and his ailing wife, Elizabeth (Anna Madeley) are so touching that tears are inevitable. The couple realizes that they are both to blame for Proctor’s succumbing to Abigail’s seduction, he for his weakness to resist a pretty, lively young woman, and Elizabeth for refusing her husband his marital rights. A husband who truly loves her, but who has for one stupid moment forgotten his marriage vows. Here are some clips from the play. Thanks to Ali and RichardArmitageNet. Elizabeth urging John to go and testify about Abigail’s manipulation. John and Elizabeth discussing his adultery. John’s powerlessness in proving he has never stopped loving Elizabeth. When madness overwhelms Salem, Proctor fails to bring back reason, making him one of the many victims. Nothing can sway the madness back to sanity, and Proctor hangs. This role is a difficult one, due to the physically exhausting action. There are not many still moments, because everybody moves and turns, faints, falls or is been thrown to the floor. Congratulations to Imogen Knight for her stage choreography. The actors’ voices must be in shreds, since there is a lot of yelling and screaming because of the collective fear and madness. For Richard Armitage in particular, it will be a challenge to keep his voice – yes, that beautiful baritone voice – intact. This was a truly enriching experience, and I loved every moment of it. Richard Armitage is not only an amazing actor, but also a very nice and considerate man. After the performance, he asked a security guy to tell the waiting line at the stage door that he would not come out. That he wanted to prepare for the evening performance – mine was a matinee, by the way. We were all spared a long, tiring wait. Thank you for that, Richard … you are a true gentleman. 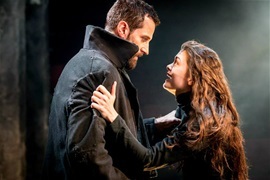 If you can make it to London this summer, go see The Crucible. It’s worth every penny! HI, could you please send me a PDF of "Mr Thornton Takes A Wife." My email address is: sales@vintagebabyboomers.com Thanks very much. We are so proud: our teacher is also an autor. I am happy to have a english teacher with such personality! !